Summer is finally in full swing around here and with Summer comes hot temperature and miserable humidity. One way you can keep cool this Summer is by stocking up on delicious sparkling waters by the great folks at Cascade Ice. Recently we were sent several complimentary bottles of Cascade Ice to review for all of you and let me tell you, these sparkling waters really come in some unique and refreshing flavors. If you love sparkling waters, check out their Orange Mango Sparkling Water, Huckleberry Blackberry Sparkling Water (my personal favorite), Blueberry Watermelon Sparkling Water (hubby's favorite) and the Strawberry Guava Sparkling Water (which is our daughter's favorite). All of those flavors sound yummy right? Well, they have many more! What is really cool about the Cascade Ice Sparkling Waters is that you can find some flavors that have Zero calories and others do have calories but they are really "light" in the caloric content...making them a fabulous beverage choice for those watching their weight. On top of that...they are gluten-free, sodium-free, caffeine-free, no carbohydrates and Zero grams of sugar. Since hubby and I are both watching our weight, that is very important for us to know when it comes to selecting healthier beverages to incorporate into our diets. (as compared to regular soft drinks). Once our sparkling waters were nice and cold...we served them up to our family members who were visiting us. Some of our guests drank them straight and two others mixed in some alcohol to make a delicious mixer. Yes folks, you can use them while whipping up some delicious tasting cocktails too! Sure beats running out to the store and buying expensive fresh or frozen fruits! Time to buy that delicious watermelon you’ve been dreaming about all winter for this fruity treat. Start with 3oz of Cascade Ice Zero-Calorie Blueberry Watermelon. Then pour 1oz of club soda. 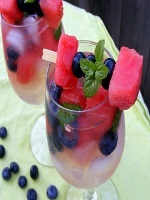 Stir it a bit and add several slices of watermelon and blueberries for the final touch. You’ve just added two servings of fruit to your family’s diet! Overall, we really loved these sparkling waters from Cascade Ice and look forward to trying out some of their additional flavors. In addition to the sparkling waters that I received, I also got several Cascade Ice promo items too, so thank you Cascade Ice! You can follow Cascade Ice on Facebook and/or follow Cascade Ice on Twitter to interact with other fans or to keep up-to-date on company news!